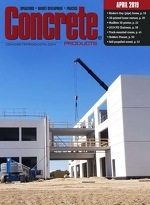 Concrete Products - Focused on Concrete Developments, Precast, Block/Brick/Pavers and Materials. Lehigh Cement Co. LLC, a wholly-owned subsidiary of Lehigh Hanson Inc., has promoted Quentin McGahey from Mitchell, Ind., plant manager to vice president, Cement Operations Northeast, based in Allentown, Pa. Succeeding him in Indiana is Jerry Miller, elevated from assistant plant manager. CTLGroup has appointed Dennis McCann, Ph.D., P.E., vice president and chief operating officer, succeeding Tim Tonyan, who has left the Skokie, Ill., testing and engineering organization. Dr. McCann has been a key member of the leadership team since joining CTLGroup as a principal engineer in 2011, leading efforts in structural performance assessment or monitoring and failure investigation. His technical expertise includes structural dynamics and mechanics, as well as risk and decision analysis. Janessa Weaver and Director of Operations Doug Pfautz have joined President and CEO Gary Weaver as partners in Weaver Precast and Superior Walls by Weaver Northeast, an Ephrata, Pa., operator entering its 60th year of business. Through 20 years with Weaver Precast, Pfautz has served in various operational, sales and customer service roles. Janessa Weaver has worked for her father’s company for 10 years, and is transitioning to the role of director of Sales.